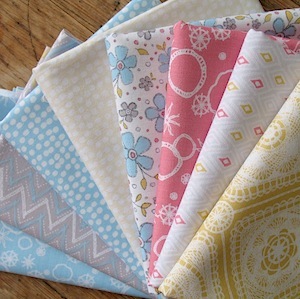 At last we can offer to you some beautiful fabrics printed here in the UK. Designed by Rebecca Stoner for Dashwood Studios. A beautiful fresh collection in soft blues and coral mixes. Delicate flower heads and stems on the softest blue base. Scale wise the average length of a flower stem is 6cm. Rebecca describes her style as organic, detailed and often delicate. She uses a combination of hand drawing and hand printing to create my designs.She loves colour and enjoys spending time experimenting with different colour palettes.